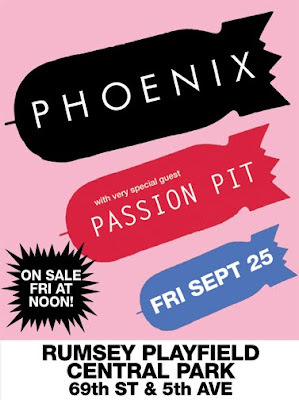 Last Friday, the french soft rockers Phoenix played Summerstage in Central Park. With little more then a "Hello, New York", the band launched through the highlights of their three albums in two straight sets with little onstage banter (although, they did thank "Passion Peet" for opening for them). It was clear that they were having fun though, "If I Ever Feel Better" was transformed into a disco-fied metal jam, and as you can see below in the video, "Liztomania" builds and crashes with more energy then the studio cut. The crowd was clearly feeling the energy, and people were dancing, which, lets face it, is rare to see in New York. I found a clip on the youtube....you can see a bunch of them if you click here.